You are here: Home :: Social Media :: What will happen to my websites when I die? 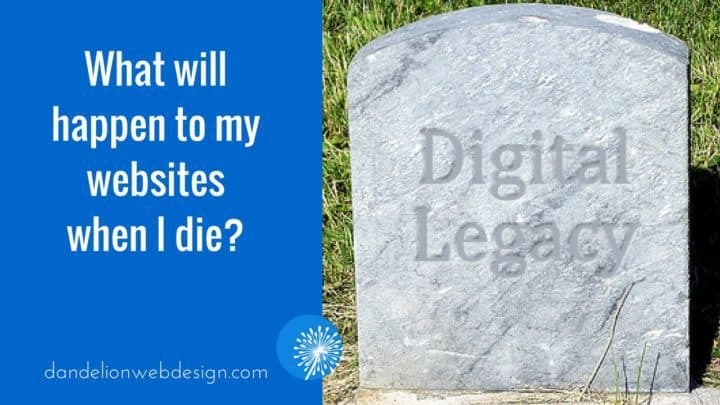 Modified: January 12, 2018 | First Published: Posted on February 23, 2010 Author Ruth Maude 2 Comments on What will happen to my websites when I die? Recently I’ve been asking myself, “What will happen to my websites when I die?” “Will someone keep them going?” The reason I actually care about this is that a couple of my sites serve niche communities; one is number one worldwide for the topic. It is important to me that these websites (https://www.amnioticbandsyndrome.com and https://www.clubfootclub.org) continue to help people even after I’m gone. This is my digital legacy. I was pleased that this important topic was presented at Podcamp Toronto 2010. In a session entitled “Death and Digital Legacy in Social Media” Adele Mcalear addressed questions such as What happens to your digital life when you pass away? What are the important things you should be thinking about while you are still here? and How do families deal with a digital legacy? This thought-provoking session was the high point of Podcamp for me. Adele’s presentation was very professional and she covered a lot of ground in the short time allocated. Consider that when you die your bank accounts and your credit cards will be cancelled; credit cards that are used by your domain registrar and your hosting company to keep your website and other paid services active. If you have a PayPal balance (or other online earnings) will your family be able to access that money? Do they know your passwords to access your computer and email? In this session, Adele introduced the concept of a DIGITAL EXECUTOR, someone who’ll know your wishes for what should be done with all your online content after your passing. A digital executor would be able to notify your digital friends and social media contacts of your passing and close your social networking accounts. The key piece of information this person will need is your e-mail password, which will allow the executor to perform password resets, if need be, to gain access to online accounts. Adele suggests that you use Gmail to give your digital executor instructions and access. Now you can use LastPass or a similar service to store all your passwords. Your digital executor will only need access to this one password to be able to access all of your online accounts. Since Podcamp I have talked with my family about my concerns and I will be taking the necessary steps to ensure that my digital legacy remains intact. Thanks Adele for a great session at Podcamp Toronto 2010! For more about this topic visit http://deathanddigitallegacy.com/. Wow I never really even thought about it but I certainly will be now. You know I honestly totally brushed off that session and I think I even said “what are they going to say, be careful what you talk about because it will be there forever?”. It didn't even occur to me that the session was about passing on your digital legacy (though I'm sure if I had read past the title I'd have known that!). Thanks so much for coming to my session and for writing such a great summary. I'm so glad that it gave you food for thought and hope that it helps your readers as well.